Antonio Chin Sosa grew up in a traditional Mayan family with his Mother, Father and Siblings. At an early age he took an interest in cooking. Over the last 22 years he has honed his skills and perfected the art of cooking. 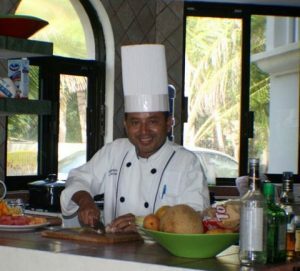 He has worked in some of the finest kitchens in Tulum, Cancun, Acapulco, and Los Angeles, California. Today he enjoys bringing on aspiring chefs and passing along his cooking knowledge. Learning the traditional Mayan language as his first language, a very difficult and complex language, has allowed Antonio the ability to learn other languages easily. He is able to speak English, French, Italian, Spanish, and his native Mayan. Click below for more weather information.